Please note that webDotTrainSim, here at webDotTrainSim.tripod.com, won't be updated after today. webDotTrainSim has moved to www.webDotTrainSim.com. You've found the new webTrainSim site! The daily line news will be as good as ever and, when everything settles, there may be a download or two available to take advantage of the extra bandwidth at the new host. With such strong support from the Trainsimming community, webTrainSim sees it as worthwhile to spend a few dollars for a better hosting site. At webTrain Sim you'll find the line news on the best freeware locomotives and rolling stock to download and step-by-step instructions to get your locos working at their peak performance. You can read any of the webTrain Sim pages by using the links on the right under webTrain Sim - they're on every page so you can quickly find the information you need.  <06-Nov-02>: A large number of contributions to the Train-sim.com library over the past few weeks have consisted of rolling stock for various railroads. For example, there have been a whole range of double and single stack TTX intermodal well cars. Also, there have been contributions of Rock Island-liveried cabooses. So browse the library for rolling stock appropriate to your favourite railroad - you're sure to find all you need. Just spotted in the Train-sim.com library: CityRail S-Set v1.2 upgrade ssetce12.zip (4Mb, 05-Nov-02) and a more practical cab for the BNSF #8010 cab (V1.2 upgrade) sd402cab.zip (5.3Mb, 05-Nov-02) - definitely on webwebTrainSim's list to download. By the way, I've got a new contact - mail me at info@webdottrainsim.com. The old one will stick work, however.  <05-Nov-02>: The following downloads from the Train-sim.com library are next on webTrainSim's list: V/Line S-class loco, with colours and cab by Christine Sweetnam, sclass25.zip (7.2Mb, 04-Nov-02), Mike Simpson's Route Riter V3.7 rriter37.zip (4.8Mb, 04-Nov-02) and Bob Boudoin's V4.2 physics ENGine files for U25C and U30C locos geuboat6.zip (17kb, 04-Nov-02). There is a set of revised sounds for the Brill PCC cars, too brillsnd.zip (1.4Mb, 04-Nov-02).  <04-Nov-02>: If you were to continue east from Whitefish to places such as Bonners Ferry, Sandpoint and Spokane in north-eastern Washington state, you'd soon see plenty of Canadian Pacific AC4400s and CEFX-leased AC4400s - cp8xxx.zip (2Mb, 02-Nov-02, where "xxxx" represents several different numbered locos) and cefx1007.zip (1.9Mb, 02-Nov-02) are available in the Train-sim.com library. On a matter not at all related to trains, see a demo of IE's filters and transitions (being trialled in the intro above) at Microsoft's MSDN site.  <03-Nov-02>: webTrainSim was up early and decided to see how he'd go at getting something downloaded from UK Trainsim. 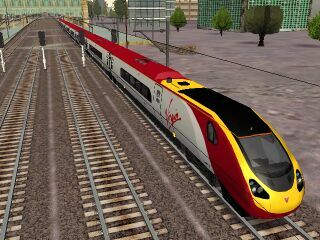 Well, he was early and downloaded Ben Laws' Virgin Pendolino v1.1 VirginCl39011.exe (2.06Mb, 14-Oct-02) and a patch, Cl390patch.exe (128kb, 14-Oct-02). There was just enought time to get ukgantries.zip (28kb, 19-Dec-01) before downloads for the day were exhausted about an hour later. Moral of the story: rise early (Australian Eastern Summer Time) to be there when a "new day" at UK Trainsim starts at 2000 UK time! Oh, a small fix is required for the Pendolino's acelacab.sms file to hear the horn from the cab - see how to do it on the Pendolino upgrade page.  <02-Nov-02>: These are some new addtions that caught the eye of webTrainSim in the Train-sim.com library: Full Bucket Line version 2 (including 22 activities) fbline2.zip (16.2Mb, 31-Oct-02), DDA40X loco pack (re-skins of the Auran model) #6900-6904 ddpck1_1.zip (4.9Mb, 31-Oct-02), Widowmaker V1.2 activity for Marias Pass 3 (take a dangerous coal load from Whitefish; non-default rolling stock included) widow12.zip (28Mb, 01-Nov-02), and a tutorial for making those map screens for routes maptute1.zip (1.09Mb, 01-Nov-02). At UK Trainsim, look for ukgantries.zip (28kb, 19-Dec-01) for an updated us1gantry.s for the Modern England route. This file replaces the us1gantry.s file copied from the default Japan1/Shapes folder. The Ligne-Roussillon route is now at version 1.4 - it's available in conveniently-size download chunks at the author's site. 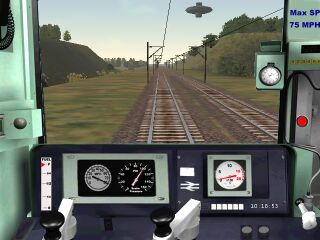  <01-Nov-02>: webTrainSim downloaded James Hunt's full version of his Modern England route (version 3) from the Train-sim.com library modeng3f.zip (18.9Mb, 30-Oct-02). After installation and the route was first chosen for a run, the Trainworld initialization error cropped up so webTrainSim followed James' readme instructions to re-run Install1.bat - all was then ok. One problem, however, is that the full structure of the catenary gantries is missing. There's an updated US1gantry.s in the Modern England Extras, meextra.zip, that fixes this problem.  <01-Oct-02 to 31-Oct-02> Line news for October, 2002 - click here.  <01-Sep-02 to 30-Sep-02> Line news for September, 2002 - click here.  <01-Aug-02 to 31-Aug-02> Line news for August, 2002 - click here.  <01-Jul-02 to 31-Jul-02> Line news for July, 2002 - click here.  <01-Jun-02 to 30-Jun-02> Line news for June, 2002 - click here.  <01-May-02 to 31-May-02> Line news for May, 2002 - click here.  <01-Apr-02 to 30-Apr-02> Line news for April, 2002 - click here.  <01-Mar-02 to 31-Mar-02> Line news for March, 2002 - click here.  Email me, Bernie Halpin, at info@webdottrainsim.com if you have questions or comments. I'll try to answer as best I can. Certainly post me if any step-by-step instructions on various how-to pages need clarification.